Ok so we all remember Stella’s costume (you dream about it nightly, huh?) and if you’ve been following along with A Joyful Riot then you may have recognized a reoccurring pattern here and that is Circus Animal Cookies (see here, here, here and here). I think they’re adorable. And delicious! And nostalgic. And fun to play with. Ok, I think they’re all the things! During my pregnancy I vividly remember a day when all I could think about was those delightful cookies and then the greatest thing ever happened. I went to my baby shower the next day and there was a giant apothecary jar FULL of them! I laughed, I cried, I embraced my perfect twin sister who somehow knew that all I wanted was those pink and white sprinkle-covered cookies that I hadn’t ate in years. 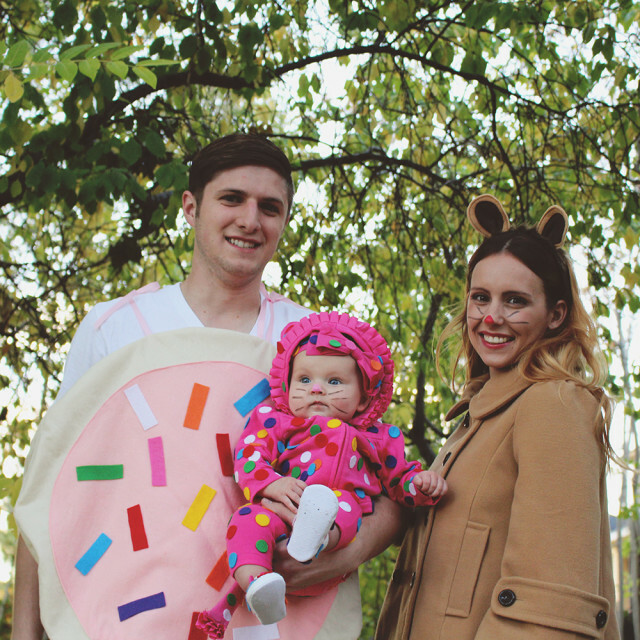 So naturally, an obsession has sprung and the only logical thing for my daughter to be for her first Halloween was a human replica of those iconic cookies. 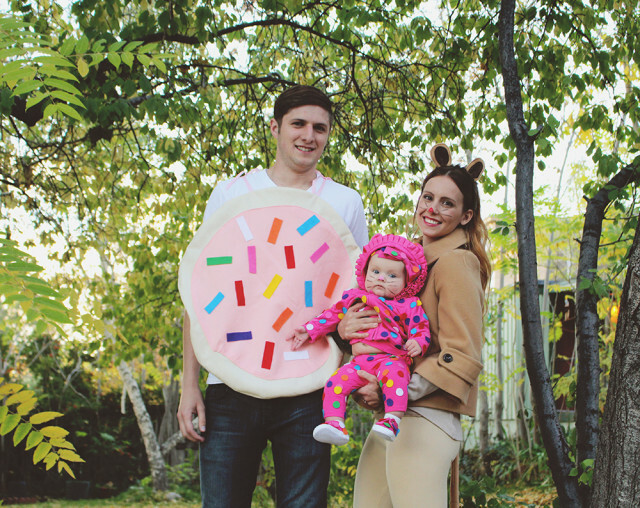 Thank goodness he’s so sweet and willing to dress his tough self up as a sugar cookie because I really do think the three of us round each other out, don’t you!? 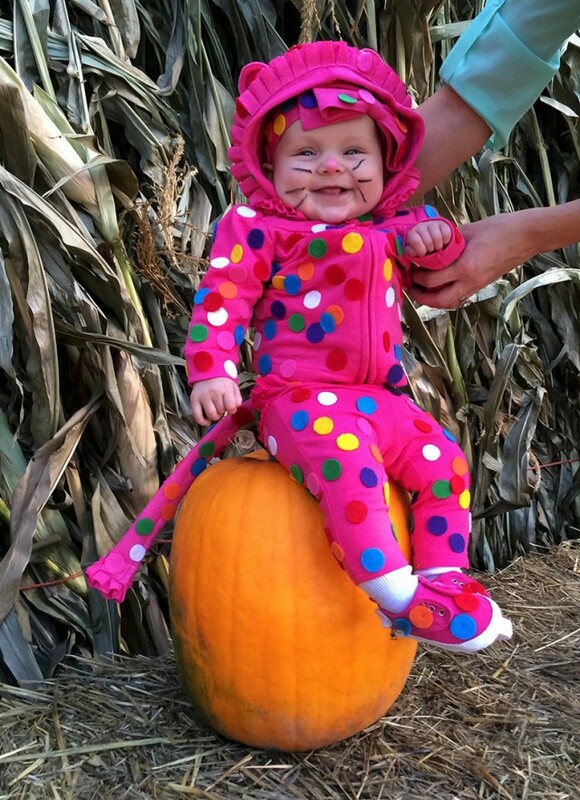 So we’ve already seen how to make a circus animal cookie costume and a sugar cookie costume so I have for you today a super simple lion costume! If you already have tan/brown clothes then this costume shouldn’t cost ya more than $6! Pretty fab right? Woohoo! 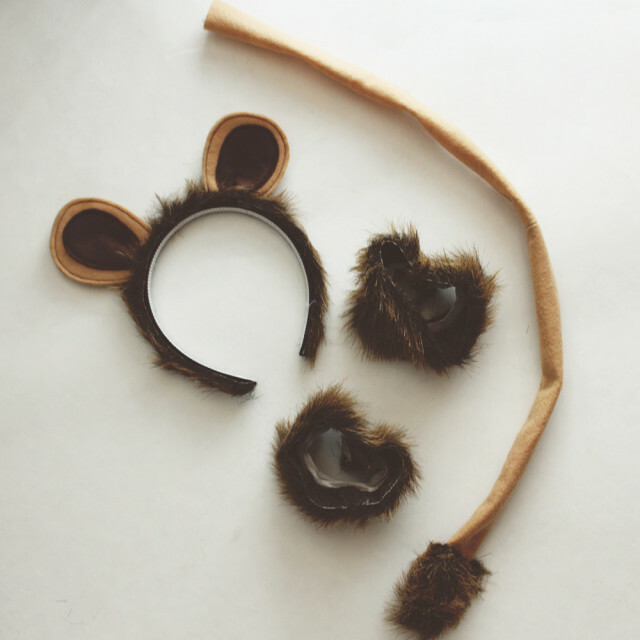 Make some lion ears by cutting out out 4 rounded-top, flat-bottomed tan ears and 2, slightly smaller brown ones. Sew around the edges of the tan ears and then sew the brown ones onto the middle. Fold over the bottom a bit and sew along it to keep in place. Hot glue a little strip of fur to the headband and then glue the ears on to it. Make some furry cuffs by cutting a length of elastic the size of your wrist. Then cut two strips of fur about 2 inches longer than the elastic. Sew the elastic to one edge and then stretch it all the way to the other end and sew down the middle. Fold the strip in half, fur to fur, and sew together then turn right side out. Now to make a tail, it would’ve been preferable to buy felt by the yard but I couldn’t find the color I needed at my local fabric store so I bought the small sheet instead. So I cut two strips, each about 3″ wide. Sew them together then sew the strip together lengthwise. Turn it right side out. Cut a piece of fur about 4″ long. Fold it in half, fur against fur, sew up the two sides. Turn your fur right side out and stick the end of your tail inside this fur pocket and sew it onto the end. You have now completed all the parts of your very simple, very portable, cheap lion costume! You can either sew it to your clothes or just slip the cuffs on and pin the tail to the bum of your pants (which is what I did!). 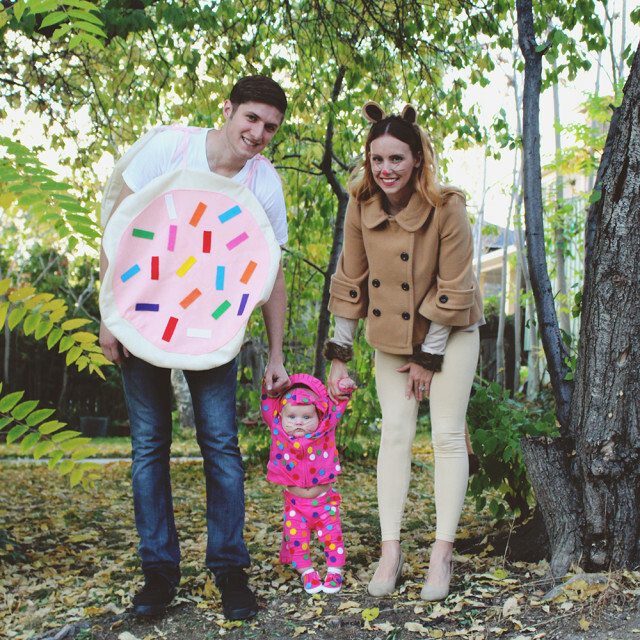 I love how our first Halloween as a family as turned out and so glad you could come along for the ride! Be sure to leave a comment and let us know if you follow and our our costume tutorials! p.s. I can’t help but laugh looking at these pictures because my Stella is the most smiley baby ever but she was oh so tired when we snapped these pics so she’s just sort of staring off lol. I’m so lucky that even when my girl is beyond tired, she isn’t teary, she’s just gets quiet and slightly distant :) luckiest momma ever. Okay, guys. Cutest. Costume. EVER. I love it! Hope you don’t mind if I “borrow” the idea! And everything else you guys do…Ha! But seriously. Nicole! You’re the sweetest and of course don’t mind the least if you borrow the idea! It would be the cutest with your baby girl (who I need to see way more pics of by the way)!